Spreadsheets | Volunteer Spreadsheets | Do-It-Yourself. 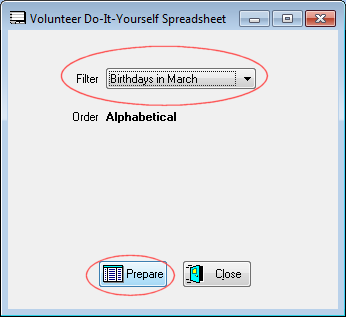 This example does a Volunteer Do-It-Yourself Spreadsheet to get a birthday list for a newsletter. At this point you can use a filter if desired to turn a generic spreadsheet that reports all records into one specific to individual volunteers or other limitation.